At the Daily Gallery one picture, preferably taken that day; is shared with others. While that is difficult to follow (shooting everyday) I have been putting up a picture everyday and this is my FOURTH year. It's been an enjoyable time viewing pictures of other members and learning new techniques and customs from different places. I think this is the best way to travel to places while sitting at home, and also making friends on the way! It has been a pleasure sharing my pictures and I thank all of you for taking the time to comment on my pictures. Earlier galleries: First year - Second year - Third year - Critiques welcome! 4th year Pic 213 - Sep - 17 2012. 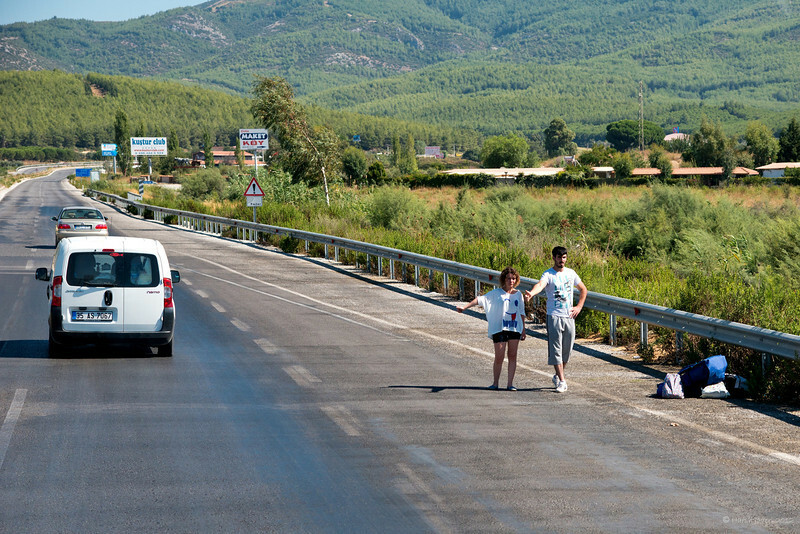 Hitch hikers - On way to Kusadasi Hi everyone! Got back from a wonderful trip to Turkey! Kusadasi, a seaside town was our first stop and this was shot from the van we were travelling in. Critiques welcome! I am buried in piled up work and hopefully should be able to check and comment on your pictures from tomorrow. Wonderful trip is good ;). Looks like by this couples baggage they are moving on. Hi Harsh - glad to have you back. I'm looking forward to photos of your trip. I was in Kusadasi about 15 years ago & absolutely loved it. Take care, talk soon. Great shot from your trip. Wonderful capture of the moment! Very nice pj and composition! Nice to have you back and I'm sure you had a great trip!